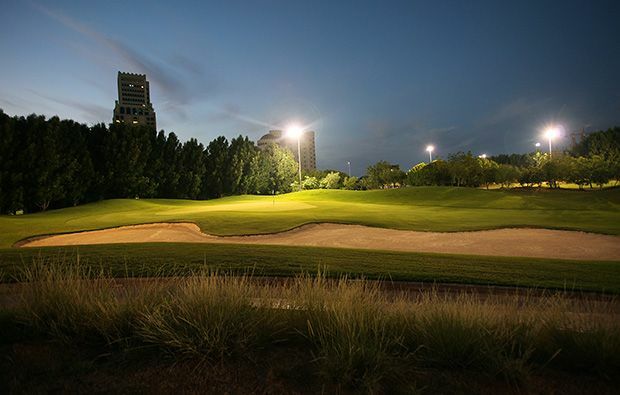 Al Hamra uses the flow of the golf course to offer both the business professional and the enthusiast the perfect opportunity to play at any time, with the installation and clever use of zero pollution floodlights to light a composite golf course, golf under the stars is more than just a dream. Harradine, has created a masterpiece that weaves its way around the four inter-connected lagoons that seem to merge seamlessly with the water of the Arabian Gulf. The construction of the course was a logistical monster with over 5 million cubic meters of sand being shaped to create the contours of the golf course. 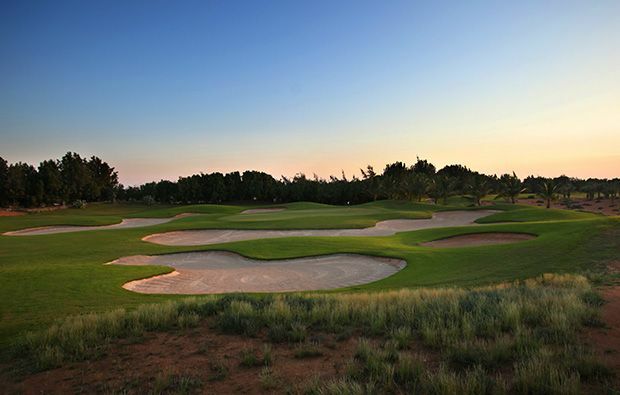 A championship par 72, the course measures 7325 yards at its longest, but offers a variety of teeing options to allow all levels of golfer to experience the wonders of Al Hamra. The course begins with a relatively straight forward short par four. Longer hitters may be tempted to take the green on, but any miss-struck shot will be in danger of finding the pot bunker in the middle of the fairway. A nice hole to get into your groove. The par five third is a stunning par 5, water flanks both sides of the fairway, requiring a solid drive to leave the golfer with a decision, take on the water that splits the hole in two or lay up short leaving a short iron into the large green. A beautifully crafted par three awaits you on the 7th, although not a long hole it requires a true strike to avoid the large bunkers that protect the front and right of the green. AL Hamra wakes up at the turn, with the hardest hole on the golf course. A monster of a par four, usually played into the prevailing wind, the drive is vital and needs to be log and straight to avoid the water that runs the length of the fairway down the left. The approach is even more frightening, played over the water that cuts across the hole you need to make sure you have enough club to carry the bunker that protects the front of the green. 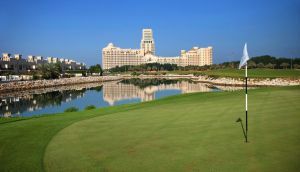 Both the 11th and 12th are both memorable holes, but it is the 18th, as with many of the courses in the Emirates, that will live long in the golfers memory. A long par five, hugging the lagoon to the right, the 18th is a tough finishing hole. The second shot needs to miss the fairway bunker to the left which challenges the golfer´s nerve. The shot into the three tiered green needs careful thought and club selection to avoid the dreaded three putt. 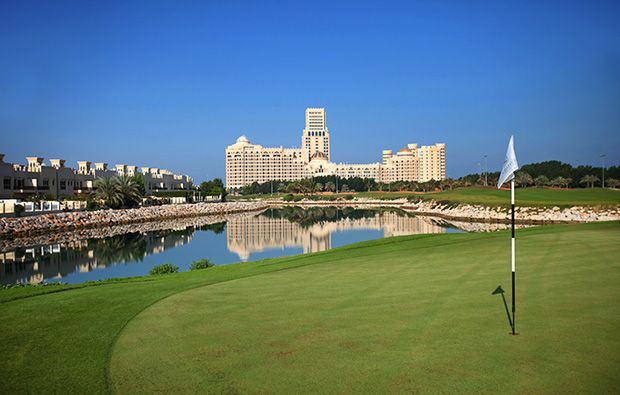 Al Hamra is a great golf course and one that you should consider playing on your trip to Dubai. 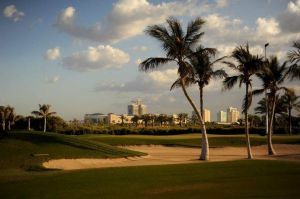 If you would like to book a tee time at Al Hamra Golf Club then its very easy to secure discount green fees by using the Golfsavers booking engine. 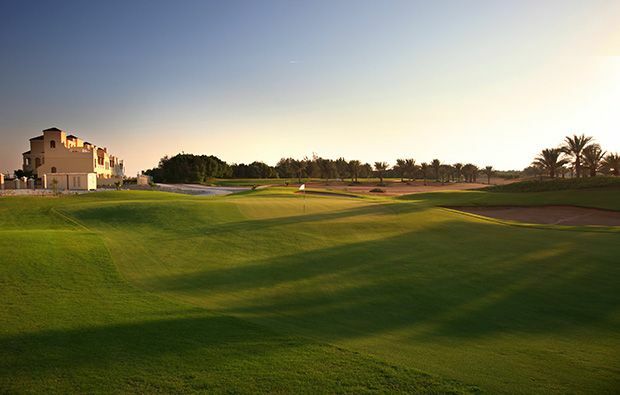 Al Hamra Golf Club is not yet in our pool of Golf Courses for orders.